Hey! Guess what? Today is Food Day. In my world pretty much every day is food day but this Food Day is a nationwide celebration and a movement for healthy, affordable, and sustainable food. I wish these things were better publicized, so how about a recipe to celebrate food day? Today we're talking Light Chicken Enchiladas, we're talking easy, yummy, whole foods made into something just as good (or way better and less salty/processed tasting) than your local Mexican take out joint. These were delish and we did make a double batch because we do like having leftovers for another day. I've said it before and I'll say it again, it never hurts to do a little prep in advance. So preheat your oven to 450 and chop up some jalapeno, garlic, onion and fresh thyme. It also never hurts to have some fresh salsa on hand. 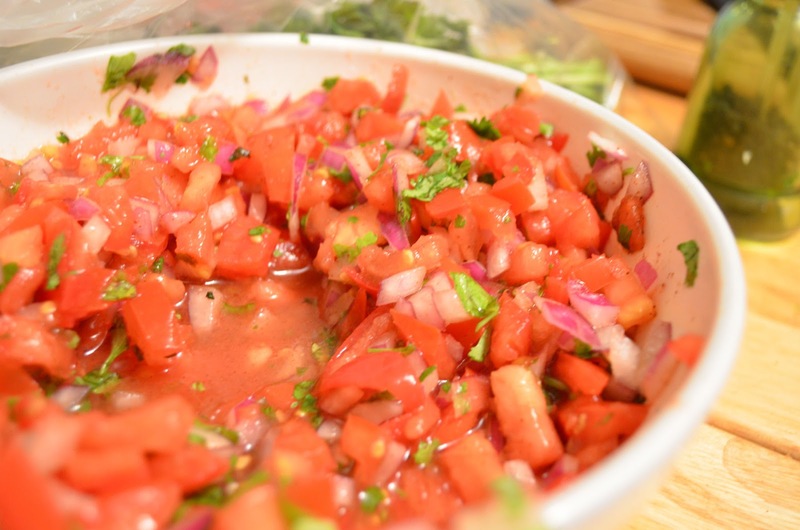 Just chop tomatoes, red onion and cilantro. Add salt and pepper to taste. Sometimes a dash of garlic powder and a dash of chili powder are a great addition if you have them on hand. And fresh lime juice. 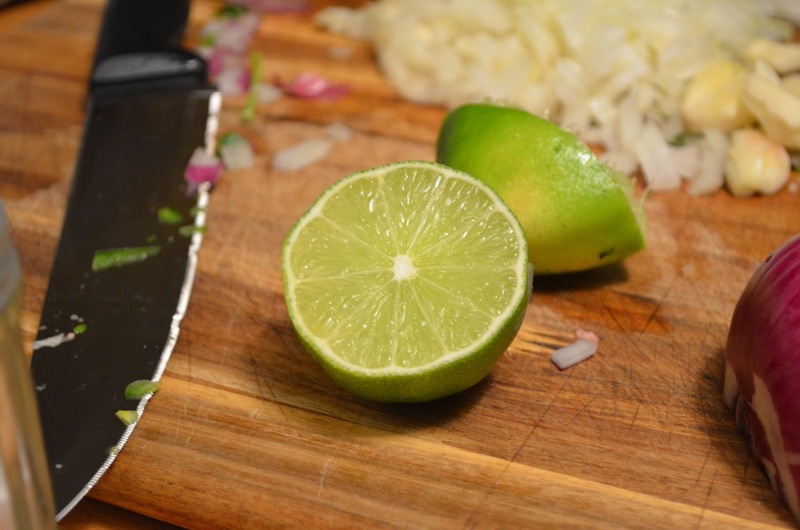 If you're cooking anything remotely Mexican, add lime. That's what I do anyway. 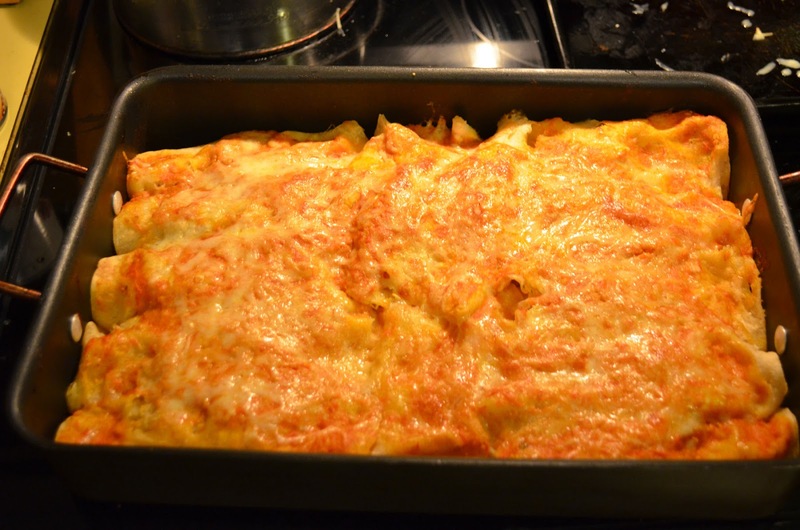 Anyway, back to the enchiladas. So you heat a tablespoon of olive oil in a large skillet and over medium high heat. Add the jalapeno, garlic, thyme and half of the onion. Once the veggies have softened, add the chicken, a little salt and 3/4 cup of water. Bring to a boil, cover and cook until chicken is cooked through and tender. This will take 6-10 min depending on how thick your chicken is. 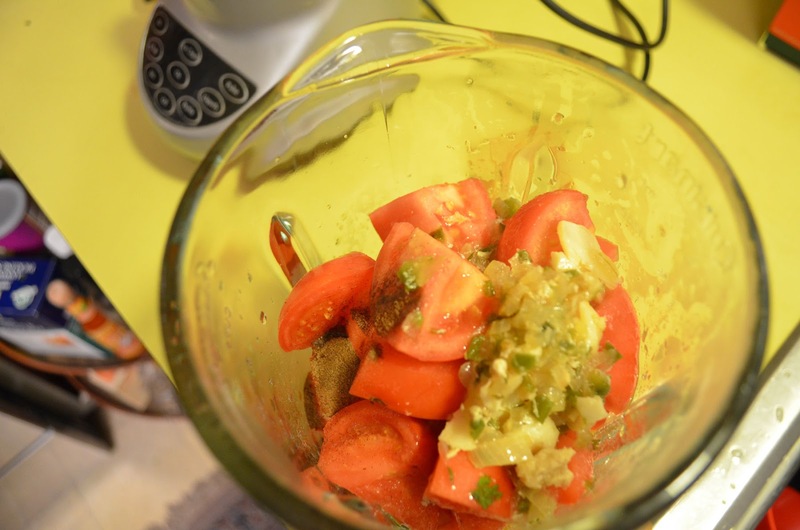 While the chicken is cooking, get about a pound and a half of tomatoes chopped and ready for the blender. 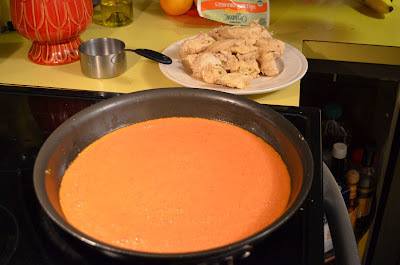 When the chicken is done, remove to a plate and add the cooking liquid and vegetables to the blender with the tomatoes and a little allspice. Puree those suckers until nice and smooth. 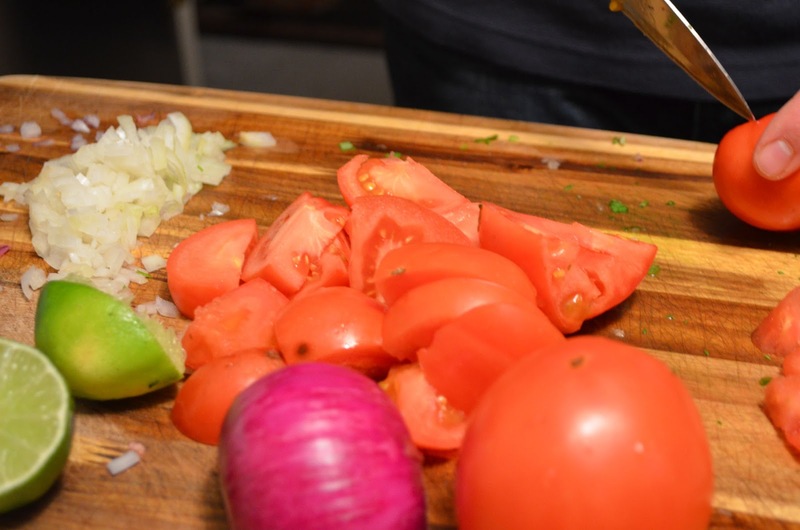 Wipe out the skillet (if you feel the need) and add a tablespoon of olive oil and place over medium high heat. Add the tomato sauce and cook until slightly reduced. 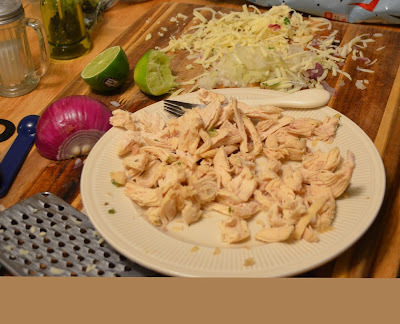 While the sauce is reducing, shred your chicken, shred some cheese and warm up your corn tortillas in the oven. Next you spoon some sauce into the bottom of the dish and fill your tortillas with cheese and chicken (and we all prefer ours with a little plop of refried beans in there too). Roll them up and pack them in the pan. 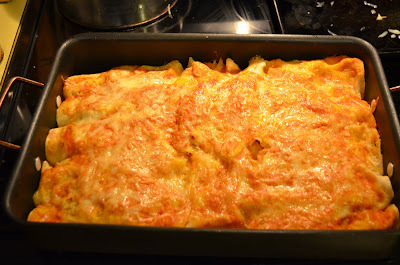 Top with the remainder of the cheese and sauce and bake until the cheese melts (and it browns up a tad~yum). 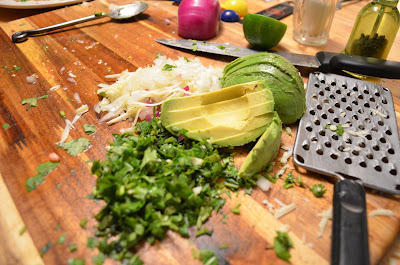 We like ours topped with cilantro and avocado and a little fresh salsa. The recipe says to add the onion to your topping but if you're not a fan of raw onion, just leave it out. Yup, tastes as good as it looks! Preheat the oven to 450. Heat 1 Tbs oil in a large skillet over medium high heat. Add jalapeno, garlic thyme and half the onion. Cook, stirring, until soft, about 3 min. Add the chicken, 1 tsp salt and 3/4 cup of water. 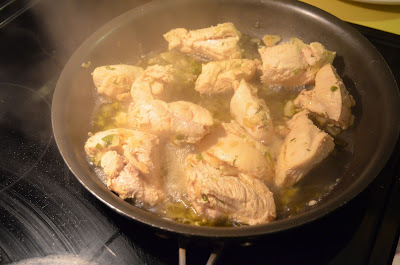 Bring to a boil, then cover and cook until chicken is tender, about 6 min. Remove the chicken to a plate. 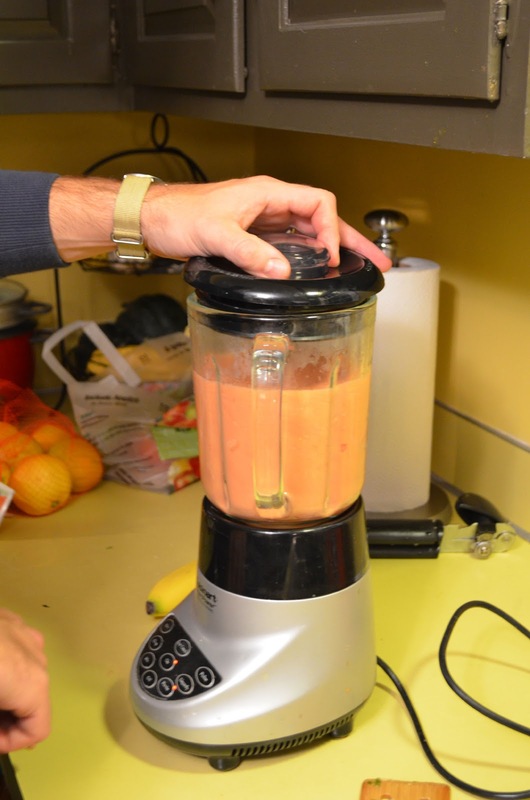 Transfer the cooking liquid and veggies to a blender; add the tomatoes and allspice and puree with the lid ajar. Wipe out the skillet and add the remaining 1 Tbs olive oil and place over medium-high heat. Add the tomato mixture and cook until slightly reduced, 6 min. Pour part of it into a baking dish. 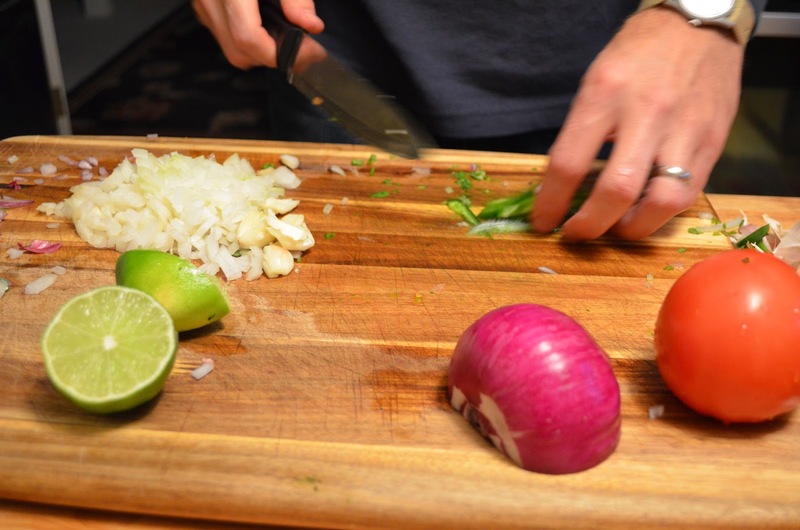 Brush the tortillas with olive oil and put on a baking sheet; bake 5 min. Shred chicken. 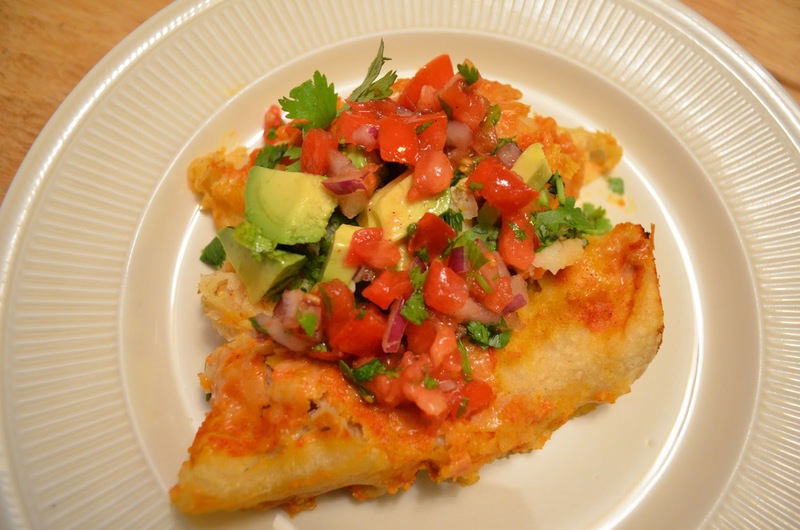 Top each tortilla with chicken and cheese (and beans if you choose! 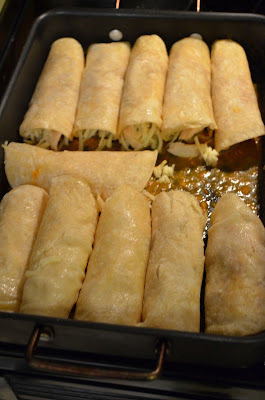 ), roll up and arrange in baking dish, seam side down, spooning the sauce over the top. Top with any remaining cheese and bake until cheese melts about 4-6 min. Toss the herbs, remaining onion and salt to taste. Sprinkle on top an enjoy!